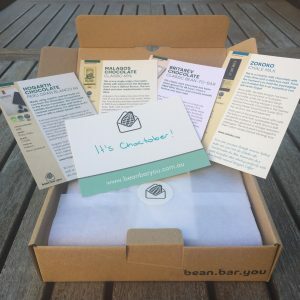 A box of 4 bean to bar chocolates for our Bean Bar You subscribers. Our ‘Chocotober’ subscription boxes went out this week, the perfect pick-me-up after the long weekend! We were so eager about our chocolates this month that our boxes didn’t fit into our usual 500g express postage bags! We were delighted to share Britarev chocolates after their long journey to get to us. We met Konstantin Britarev in a Moscow coffee shop on a sunny spring (-9C!) day. His smooth, but powerful chocolates were a revelation, and his enthusiasm for bean-to-bar chocolate was infectious. The beautiful packaging and flavour of his 70% Venezuela bar reminds us of the fabulous, strong Russian culture we experienced in our travels. Karl Hogarth makes the most amazing chocolates. He’s a really nice guy and cares so much about each step of the process. We think this comes through in his chocolates in every way: the packaging, mould & flavours work perfectly with the story behind each bar. We had four dark bars to choose from, including a 66% from Peru and a 75% from the Dominican Republic. When you didn’t think you could find better packaging – we found you Zokoko. With prizes for both their chocolate and their packaging, we can’t get enough of these Australian bars. Subscribers received either their milk or dark bars. Zokoko also have a beautiful cafe – you should pop in for a visit when you are next in Sydney. Malagos is another wonderful story. Two months in a row we bring you one of the rare tree-to-bar chocolates. Malagos are famous within the Philippines for good reason and we hope you like their flavours as much as we do. 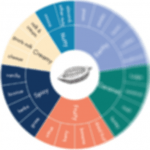 We gave subscribers one of the three strengths of their single origin Daveo bars – 62%, 72% or 85%. If you’re not a subscriber but would like to try any of these bars, head to our website where you can buy some individually, or subscribe to get a new selection every month! Any questions or feedback get in touch by email or on social media.